Yesterday, Tom Verducci wrote his 2011 article on his famed eponymous “effect”. The Verducci Effect refers to his theory that young pitchers who see a steep increase in their work load tend to suffer in their production in the following season. Timely work there Tom, as I just wrote about a similar “year after effect” with the staffs of World Series teams. In that article, however, I said that Tim Lincecum and Jonathan Sanchez are the two arms on the Giants’ staff that I worry about going in to 2011. Especially, Sanchez as he did actually run out of gas in the playoffs. Verducci’s model points to MadBum as the 2010 pitcher most likely to suffer from VE due to his age and his 73 inning increase over 2009. However, he also points out that Madison’s build (he’s a big, strong lad) and the Giants’ success with keeping their young pitchers healthy might mitigate any year after effects. So Giants’ fans: are you worried about Madison Bumgarner? This is exactly the kind of issue that plagues teams trying to repeat (Verducci even cites Cole Hamels 2009 decline following the 2008 championship run as an example). Even after reading this article, I am still not worried about MadBum, or at least still not as worried about him as I am about Lincecum and Sanchez. One thing that has gone unsaid, at least in the few responses I’ve read, is that Madison suffered a major regression in 2010! In ’08 and ’09 he threw the same number of innings (141.2 vs. 141.1), so there was no reason to be alarmed by those numbers. He did well enough that the Giants were prepared to hand him the 5th starter position this spring (remember Todd Wellemeyer was brought in as a back up plan, not as a primary option). However, Bumgarner got off to an extremely slow start this spring, likely due to some unfortunate circumstances. His velocity was down, command off, and his preparation and conditioning were questioned. Many, myself included, thought the sky was falling. This is not to be critical, he was a 20-year-old kid who just got married and was grieving the loss of a family member. In the end, it seemed he had some mechanical problems and once those got fixed everything came back together for him. And the eyeball test appeared to show that he got stronger as the season went on. All that to say, a lot of times we get way caught up in the stats (I’m definitely pointing the finger at myself here) and we can forget that these guys are human. In 2010 Bumgarner matured in many ways, not all of them baseball related. I feel pretty strongly that Bumgarner will have a completely different approach to this offseason and come to spring training ready to go. And, if he can figure out a way to replicate the “get-stronger-as-you-go” formulas from last year he, and the Giants, will be sitting pretty. This entry was posted in Giants and tagged bumgarner, giants, pitching, verducci, year after effect. Bookmark the permalink. I trust my comment will be positively moderated. I’m not worried about any of the Giants pitchers, Sanchez in particular. He did a much bigger jump in 2008 and has just gotten better each season since, particularly K/9 and WHIP. Cain also had a jump as well, and has never had any injury issues. Bumgarner was still pumping in mid-90’s fastballs in the World Series, so I don’t see him being affected by the increased workload. I’ll bet that Verducci will point to Bumgarner if he doesn’t repeat his 3.00 ERA of 2010, but the fact of the matter is that ERA fluctuates anyway. I would look at his ratios for a better sign of a decline. Lincecum I’m worried about, but not because of Verducci. He was totally abused in terms of usage in college, yet never needed to ice his arm. 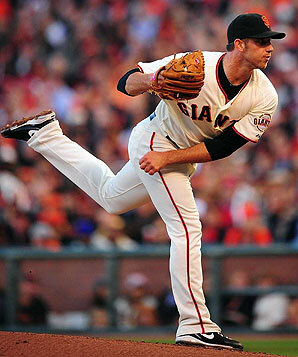 And in terms of extra IP, he totalled 249.1 IP, only 24 IP more than 2009 and 22 IP more than 2008. That’s below the Effect threshold. He had a 80.2 IP jump in 2008 yet did much better in 2008 vs. 2007 and raised the bar even further in 2009. With his new slider, I expect Lincecum to abuse hitters to an even greater degree in 2011, to sub-2 levels. I would also like to add that I’ve heard Krukow for years talk about not pushing young pitchers in terms of IP jumps. I also wonder if anyone has compiled Verducci’s 10 year history of these “effects” and see how it has held up in terms of performance. Did his predictions work out as he said they would, generally? Now, my theory, and I’ve never had time to research this in detail, but I noticed this perusing the old Graphical Pitcher/Player annual (early, unfortunately, now geared towards fantasy players), that pitchers who threw over 3500 pitches in a season usually had a bad season either that season, the next, or the one after that. Unfortunately, they had proprietary measure of performance, so I’m not sure how to measure it, say, with baseball-reference.com (WAR?). Of course, given the short shelf-life of pitchers, maybe that is just part of being a pitcher. That might void this idea. But, for example, Lincecum went over in 2008 and he arguably had a down season in 2010. Oddly, I wrote about this speculation on my part that season, and in the two seasons since, Lincecum threw 3438 and 3437 pitches, just under that threshold. Of course, his playoff pitching blew him through that limit in 2010, and hence why I do worry about Lincecum, but not for 2011, but 2011-12. But there were pitchers who beat that limit and kept on keeping on: Clemens and The Unit. Maybe the Freak can do it too? Excellent points. I do worry about Sanchez…he’s the one of the four who has had injury problems before. He’s also had the yo-yo effect of being a reliever, then a starter, then a reliever, than a starter. i know there is no major jump and he’s too old for the VE, but i just don’t trust the guy. he’ll probably put it all together this year and be our best starter. as far as timmy goes, like i’ve said before, everything about him: build, delivery, usage, screams major arm injury waiting to happen. but other than losing some velocity there has been NOTHING even hinting at an injury yet. so either he really is a freak or there’s some kind of blow-out about to happen just around the corner. thanks for the pitch # theory. good stuff! can’t wait to see what you come up with!